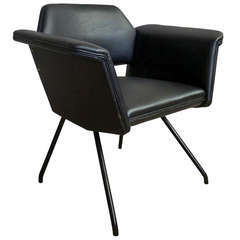 Armchairs model 770 by Joseph-André Motte for Steiner, 1958. Black metal-lacquered feet. Recently reupholstered with the Bisson Bruneel fabric "Copenhagen". 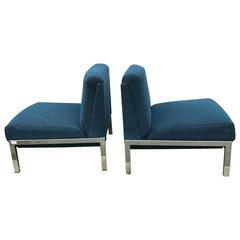 The pair comes with an ottoman. Matching sofa is available, but not included. 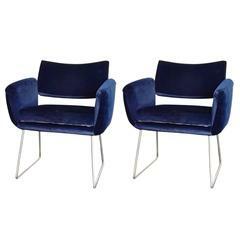 Pair of "Samouraï" slipper chairs by Joseph-André Motte. Polished stainless steel feet. Blue velvet upholstered. Editions Sieges Steiner. Good vintage condition. 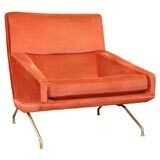 Large single chair by Joseph Andre Motte with original fabric and finish.